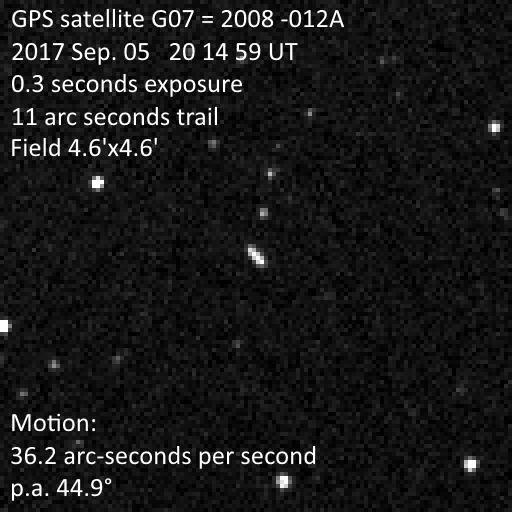 Measuring the positions of very fast moving near-Earth objects using a telescope and CCD requires the start time of exposures to be accurately known. With modern star catalogues and a strongly recorded target, the errors in the positional measurements of RA and Dec can be as small as +/- 0.1 arc-seconds, but for an object moving at e.g. 300 arc-seconds per minute, to match that precision the exposure start time needs to be known in absolute terms to 0.1 / (300 / 60) seconds = 0.02 seconds. There are plenty of ways of trying to ensure the clock timing of a system is good (GPS hardware, NTP synchronisation over the internet etc. ), but it is much more difficult to determine the absolute accuracy of the end result, i.e. the accuracy of the start time of an exposure. A post on the Minor Planet Mailing List by Bill Gray (message #32821) titled "New on-line tool to help detect/measure timing errors in astrometry" has given astrometrists the means to test their systems and determine their absolute timing accuracy relatively simply. The steps I have taken to measure my system are given below and I would recommend that observers try Bill's approach to measure their own equipment. It does not help in identifying which components may be causing problems but does provide an absolute measure of accuracy which is otherwise very difficult to obtain. Bill's approach is to take images of GPS and GLONASS (the Russian equivalent of GPS) satellites and measure their astrometric positions. The orbits of these objects are very well known, from the early 1990's to about 24 hours into the future and to an accuracy of just a few centimetres. As these satellites are generally moving at apparent speeds of 2,000 - 2,400 arc seconds per minute, or 30 - 40 arc seconds per second, they can be used as a very sensitive gauge of the absolute timing accuracy of an astrometric imaging system, with all the delays and errors from CCD camera shutter, imaging software, operating system, timing source and even observatory topocentric coordinates combining to affect the final measurement. The positional accuracy in RA & Dec can be expected to be of the order of 1 arc-second or better but a timing error of 1 second in the clock will manifest itself as a 30-40 arc-second discrepancy with the ephemeris, so allowing a very sensitive measure of timing accuracy. This link allows the observer to display those satellites that are higher than a selected altitude at a given time. Here an ephemeris can be generated for a previously selected satellite. Trying to measure long trails accurately is notoriously difficult and so I have kept exposures very short, experimenting between 0.2 and 1 second and settling on 0.3 second exposures which allows Astrometrica to determine a good centroid in the standard 3-pixel radius aperture I normally use with a trail length of about 10-12 arc-seconds. Displays those satellites that are higher than a selected altitude at a given time at the observer's location. Generates an ephemeris for a previously selected satellite. Satellites are generally 12th to 14th magnitude, moving at 2,000 - 2,400 arc-seconds per minute, or 30 - 40 arc-seconds per second. Ideally use exposure times short enough to limit trailing so that the entire trail fits within the measurement annulus during measurement, allowing automatic centroiding of the target. At Great Shefford, with a 2.2"/pixel scale and a 3-pixel radius aperture in Astrometrica, a 0.3 second exposure allows the 10-12 arc-second trails to be easily measured. As an example, with a 2.2"/pixel scale and a 3-pixel radius aperture in Astrometrica, a 0.3 second exposure allows the 10-12 arc-second trails to be easily measured. Make sure that the exposure mid-time in the resulting MPC formatted astrometry output is written out to 6 decimal places (in Astrometrica, use the Time precision value in the CCD settings). The observations in the example above cover the period 2017 September 05 from 20:14:53 - 20:15:23 UT. The residuals in RA and Dec are 0.94" and 1.4", but these, translated to timing error and cross track residual are +0.046 seconds and 0.33", i.e. assuming the time of observation is late by 0.046 seconds causes the overall residual to be reduced from about 1.7" to 0.33".